Scientists in the US and China have developed a biodegradable alloy for use in medical implants. The new alloy, called JDBM, mixes magnesium, neodymium, zinc and zirconium. JDBM degrades uniformly in physiological conditions so further surgery to remove implants made from it would not be necessary. Atherosclerosis is a precursor to heart disease and occurs when artery walls thicken from cholesterol build-up. 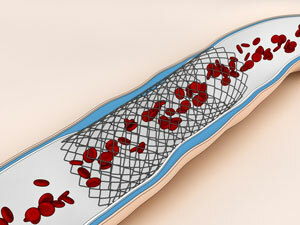 Surgical atherosclerosis treatment uses a mesh tube called a stent to restore blood flow in blocked blood vessels. While most currently used stents are non-degradable and require further surgery to remove them, stents made from JDBM by the teams of Rong Fan at Yale University and Guanyin Yuan at Shanghai Jiaotong University will degrade in the body so won’t need to be removed.